The Cheetah is quickly becoming a fan favorite. It comes in 2 sizes, small (12-2), and medium (3-6). It easily adjusts with a push of a button! 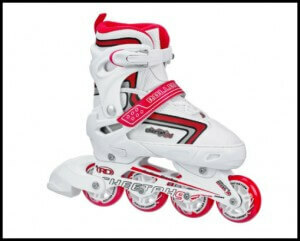 Don’t let the price fool you, it is a quality skate, and best of all it grows with your child! 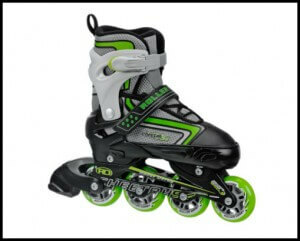 INFORMATION: Tough yet stylish, the Cheetah S4 adjustable boys’ inline skates are the perfect choice for growing skaters. The Cheetah S4 is built around a lightweight, adjustable aluminum frame that grows along with your little ones (the skate adjusts through four sizes). The skate’s also extremely comfortable on the foot, with a deluxe padded comfort foam lining and reinforced ankle support with power straps. And the Cheetah S4 owes its performance to the 64/72mm urethane speed formula wheels and SILVER-5 SPEED RATED (carbon), which are designed with speed and stability in mind. The skate also includes a heel braking system.